As Catholics and non-Catholics alike get ready to welcome the leader of our worldwide Church here on American soil, the media is literally going ga-ga. Headlines and cartoons and analysts galore are filling the airwaves with all sorts of anticipation of what Pope Francis might say or do as he meets President Obama, speaks to Congress and visits the United Nations. Is he going to allow gay marriage? Divorce? Condemn capitalism? But, reader, tweeter, listener, watcher … beware! The non-Catholic media wants to turn Pope Francis into a man who is going to turn the Catholic church on its head. But, as Teresa Tomeo likes to say: “Newsflash, the Pope is still Catholic” — and he’s not going to change a thing about Catholic church teaching, which has been held since Jesus walked the earth. We can speculate and infer and twist his words to our culture’s liking all we want, but it just isn’t happening. I say all this to encourage everyone — Catholics and non-Catholics — to get your news about Pope Francis’ visit straight from the source … and that would be The Vatican. Go to Vatican.va and READ FOR YOURSELF what Pope Francis said. Please don’t read what the New York Times or ABC News or NPR said he said. Nine times out of 10 they get it flat wrong. There are lots of other great Catholic-based media sources that will also provide you with accurate information from experts and journalists who are well versed in Catholic teaching, who have covered popes for decades and who understand Church law and history. EWTN — It doesn’t get any better for television or radio than the Eternal Word (ie Jesus) Television Network. They will have around the clock coverage of the World Meeting of Families, Pope Francis’ whereabouts and the Synod on the Family. Find out what’s on when here. Teresa Tomeo — One of my favorite journalists for telling it like it is, but with a sense of humor :). She’ll be broadcasting her Ave Maria Radio/EWTN Radio show Catholic Connection LIVE from the World Meeting of Families this week 8-10 a.m. Eastern on Catholic radio stations. You can also stream it live via the EWTN app, tune to Sirius-XM 130 or listen online. Al Kresta – Al hosts a weekday afternoon drive time show on EWTN/Ave Maria Radio from 4-6 p.m. called Kresta in the Afternoon. He’ll provide a recap of the news of Pope Francis’ visit each day. The Catholic Channel on Sirius-XM 129 – They are changing themselves to Pope Radio this week. 🙂 Lots of great shows airing all day long. Joan Lewis – As the Rome correspondent for EWTN, Joan knows about everything there is to know about the Pope and the Vatican. Follow along on her blog. Aleteia – A fairly new website with a more contemporary slant newly edited by Elizabeth Scalia. They sponsored the adorable Popemojis (emoticons & emojis for your smartphone) and will provide more youthful coverage of the Pope’s visit. National Catholic Register – Solid Catholic news coverage online and in newspaper format. What did I miss? 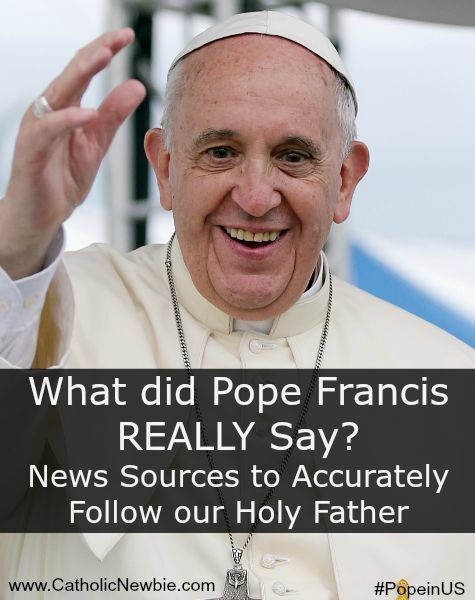 What are your favorite Catholic news sources that get Pope Francis right and provide fair and balanced coverage? Remember, take non-Catholic news coverage with a grain of salt and read the REAL story for yourself so you can make informed judgments and commentary on Pope Francis’ historic visit to America.